I entered this world like anyone else. A slimy, dirty, nasty looking pile of American baby. Fresh out of my mother’s womb. And like anyone else I kicked and I cried and I whined to my mother and to my father. Like you did, and he did, and she did. I did. But then the clocks ticked and I began to grow. And as I grew, the clock’s hands, like the paint filled hands of a preschooler in art class, began to paint my the color of my skin not like yours, not like his, not like hers, but like mine. Like my mother’s. Like my father’s. And like those that came before them. I discovered this brown paint on my body and then: these men in the history books: they aren’t me. The women on the TV screens: they aren’t my mother. The men on capitol hill: they aren’t my father. This paint. This damn paint would not wash off my body. I soaped and I soaped and I soaped and I rinsed and I rinsed and I rinsed and I repeated. No amount of water, soap or bleach could ever make it go away. Everyday, I will look in the mirror and I will see my paint. My 300 year old tattoo. I will carry it like my father did and my son will. I will carry it to the skies and when I reach the top I will stand. Proud. To carry my paint. My tattoo. Our skin. 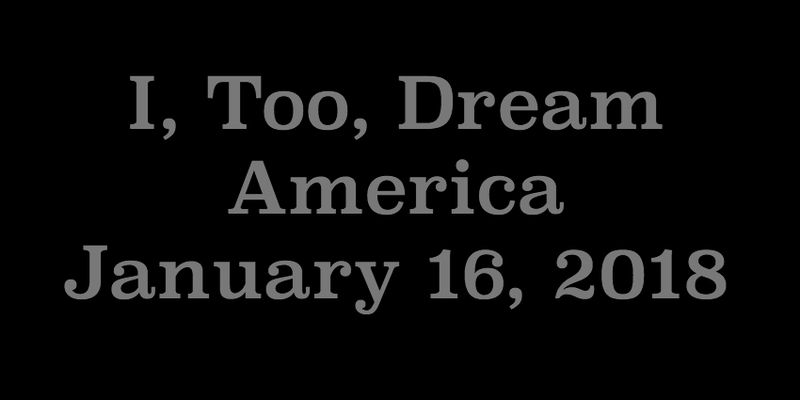 I, too, dream America. For I, too, am America.